It turns out that “Curly Girl Designs” has really expanded their line and now you can get this design on magnets, notepads, post-its, candles, water bottles, laptop skins, portable mini shopping bags and art prints. 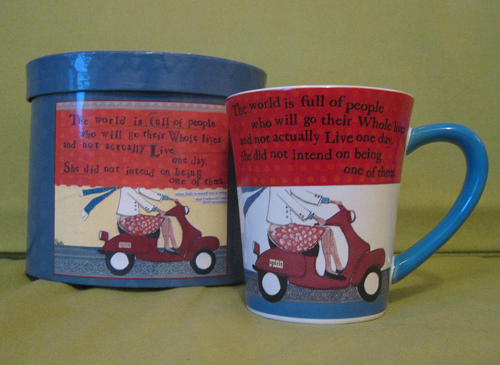 This entry was posted in Art, Ceramics, Pottery, Clothing, Decor, Miscellaneous, Stationery and tagged coffee cup, Curly Girl Designs, scooter, Stationery, vespa, Wall Prints by Tracy. Bookmark the permalink. Today, I found the water bottles at Alameda Floral, inside the Key Bank Building, at SW 5th & Main, downtown Portland OR.